Many of us use our iPhones and iPads in the kitchen to assist with recipes or even entertainment while cooking, and they work wonderfully for this purpose. But electronics and turkey gravy don’t mix well, and to have a hassle free experience you’ll want to follow a few simple tips to help prevent frustrations, a mess, or worse. So, keep your iPhone free of pumpkin pie mix, adjust a display setting, protect it from splashes, and work with a disposable stand, and you’ll be good to go. First, you’ll want to make sure the screen stays on so you don’t have to constantly fiddle with buttons and pass codes while you’re in the middle of reading a recipe. Instead, your iPad or iPhone screen will stay lit up. This is an easy settings adjustment that you can make on any iOS device, but you’ll only want to do this temporarily while you’re working, since it will drain down battery life and also prevent the passcode from turning itself on. Now you can set the iPhone or iPad up, open your favorite recipe or movie, and use it without worrying about the screen going dark. 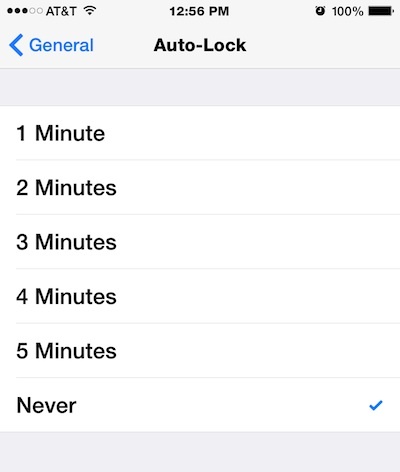 As mentioned, this should only be temporarily, and you will want to switch this back to a more secure setting once you’re finished up with the kitchen festivities so that your iPhone or iPad will lock itself with a passcode again automatically when left inactive. Any generic and clear zip lock bag will protect your iPhone or iPad from splashes, spills, and dirty fingers, which is pretty much essential for the kitchen and when cooking. There’s really nothing to this, just use any zip lock bag that is clear and fits the device you’re using, the touch screen will continue to work when it’s placed inside the bag. No more worrying about messy fingers or cake mix smudges damaging the iPad or iPhone, as long as you’re not doing anything too crazy and the ziplock is sealed well, you’re good to go, and you can use grubby hands to swipe around on the protected screen as necessary. We’ve discussed this before for the iPhone and iPad, but it always amazes me how many people are not aware of how effective this is given the simplicity. You’re not going to want to take a zip-locked iPhone scuba diving into the Mac & Cheese dish or anything, but for basic needs, it’s more than sufficient. Now that you’ve got the screen to stay lit up and the device is protected from basic ingredient exposure, you’ll want to set the iPhone or iPad up so that you can easily read it. Sure you can use a fancy stand, but for a potentially messy environment like the kitchen, it may be better to use one you’re not too concerned about. 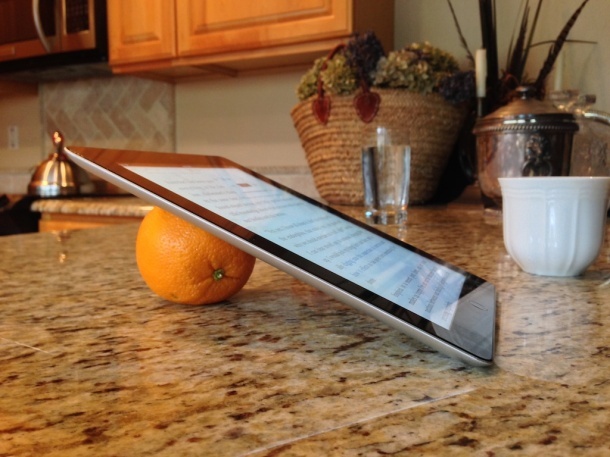 There’s plenty of DIY options for a quicky iPhone or iPad stand, ranging from propping an iPad up against an orange or banana (yes seriously, a friend showed this to me and they grip surprisingly well!) to one of my personal favorites, the Do-it-yourself iPad coat hanger stand which works surprisingly well, and since it’s just metal you’re really not going to care if it gets pumpkin pie mix all over it. 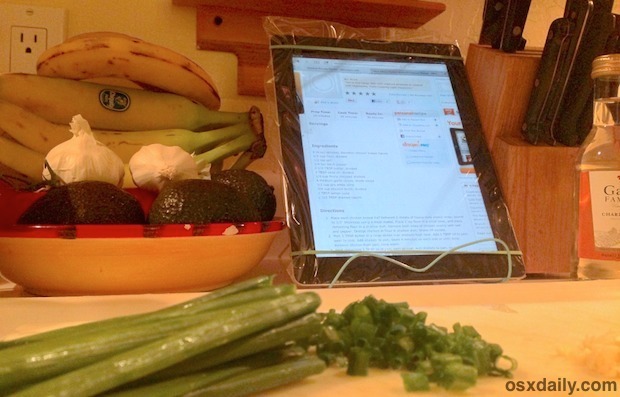 Got any other helpful kitchen or cooking related tips for the iPhone or iPad? Let us know in the comments! iPad as a Grocery List… Stuck on a Refrigerator! – Make EVERYONE turn their iphone on silent, and put them all far away from the dinner table, out of sight and out of reach. No exceptions. Enjoy each others company, don’t be staring off into a screen at who knows what. I’ve heard of some families implementing that for the entire get-together, and frankly, I’m not opposed to that idea either. We’re all on the verge of being digital addicts these days, have to enforce breaks. Very good RJ. Didn’t cross my mind but now it’s going in effect tomorrow! Great tip! Life proof case works well for kitchen, pool, ocean, lakes. It’s s good case bit expensive though. Great one, will add to the list! I do cook a lot with my iPad using MacGourmet from Mariner software. I detect a bad incident with Pumpkin Pie Mix in your past! I have been doing this for some time. I converted my Williams-Sonoma recipe book stand to an iPad stand. It has a protective plastic cover and can be set at different angles. I save my recipes in a Dropbox folder, so that I can add to the digital cookbook from any device and have the recipe ready to go on my iPad when needed. Thank you; I’ll pass these tips on to Cook. If only I knew her email. I cannot find autolock in General on my iphone 8 plus. I had a fear of getting my iPad slip multiple times and yes waterproofing was a big issue too.